Anita Sarma is on the final stretch toward achieving her goal, a Ph.D. in Computer Science from UCI in June, 2007. Following an undergraduate degree in her native India in Finance and Marketing, she took a job as a software engineer learning to code and design. When this became repetitive, Sarma looked toward research and exploring new technology. She went on to get a master's in Computer Science at UCI and then entered the Ph.D program. Experiencing a new culture and participating in cutting edge research motivated her to come to the United States to further her studies. Her interest lies in software engineering with an emphasis in design. The wide variety of faculty and the reputation of UCI as one of the best centers for software engineering is what lured her to the Bren School. She enjoyed the benefits of a one year fellowship and admits that the sunny California weather was a big plus. Irvine is a long way from her home and family in Pune, Maharashtra, India, where she visits at least once a year and keeps in contact with her family through phone and Instant Messaging. Her time as a Ph.D. student have been positive for Sarma personally and professionally. Attending conferences all over the US as well as Brazil, Finland, Great Britain and Canada allowed her to meet colleagues and get feedback on her work. Sarma's research aims to prevent breakdowns in the coordination of software development projects. Coordination is an important aspect of every day life and software development is no different. Software development especially involves multiple people working together on highly interdependent tasks and coordination among developers is a critical factor. Breakdowns in coordination frequently lead to conflicts, lowered software quality and higher costs. Sarma is interested in understanding when and how developers coordinate and what can be done to improve coordination. Towards this goal, Sarma has developed a novel approach to coordination, whereby developers are warned of relevant parallel activities and changes that will lead to potential development conflicts. She has designed and created three software applications that follow this approach and are designed for different domains and different phases of the software life cycle. Sarma's advisor, Informatics Department Professor Andre van der Hoek, said, “Anita's work on Palantír, a "virtual spy" that team members informed of who is making change where in the code, helps software developers in avoiding coordination problems rather than having to deal with them at a later time." These software applications will enable development to be smooth and efficient and lead to better quality of software and lowered production costs. 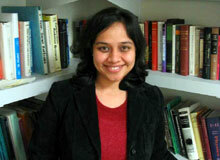 "Her work which has been recognized and well-cited in the software engineering and computer-supported collaborative work communities, is exemplary in taking an initial idea, building the appropriate theoretical perspective, exploring alternative realizations, and carefully and comprehensively evaluating the work to understand its impact,” van der Hoek added. After graduation, Sarma’s goal is to be a professor. She was a TA during her first three quarters and at first found it very intimidating. As she gained experience and confidence, she enjoyed creating lectures and interacting with students. As a professor she can do research and mentor students. “Teaching goes hand in hand with research in academia, which gives a chance to interact with bright minds and get fresh points of view,” she said. For anyone considering pursuit of a Ph.D, Sarma recommends initial participation, interaction and involvement with graduate students and professors allowing oneself to get a good idea of what is available and suited to one’s individual needs and talents. Sarma met her husband, a graduate student in Physical Sciences at UCI, on a hiking trip to Yosemite and they now live in Verano grad student housing on campus. Their lives are consumed by their work, but they also enjoy movies, book stores, hiking and cultural programs put on at the Barclay Theater and Clare Trevor Arts Center. She likes cooking exotic dishes, learning new languages and dabbling in painting. She enjoys hanging out at the campus bookstore and the open grassy areas of Aldrich Park. As she looks toward her future which may take her far away from Irvine depending upon where the job offers lead, Sarma will take with her the varied and what she describes as “awesome and unique” experiences with which UCI in general and ICS in particular has provided her.